Ownership / Access: privately owned by Mrs Dillon. 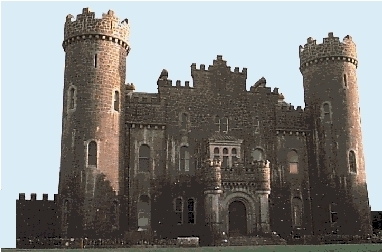 Notes: Clonyn Castle also known as Delvin Castle, is a Victorian country house situated in Delvin, County Westmeath, Ireland some 18 km from Mullingar along the N52. It is a square, symmetrical, two-storey castle-like building of cut limestone with four tall, round corner towers at each corner. The interior has a large two-storey hall with gallery and arcading. It was one of the last Victorian baronial castles to be built in Ireland. A golf course open to the public lies behind the castle, 500m from the centre of Delvin.